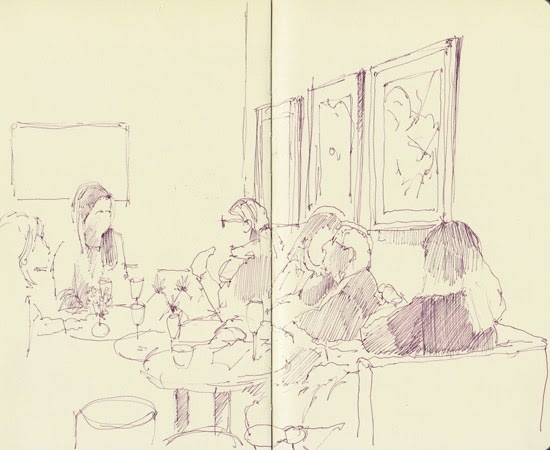 I've been sketching in the Friends Room at the Royal Academy of Arts for years - but the experience of trying to get in and get a seat had become more and more tortuous as the pressure on space from the 90k Friends became more intense. In recent times, I've more often walked in, gasped at the queue and then walked straight out again and gone straight across the road to various options at Fortnum & Mason so I could contemplate whether an Annual Friends Membership (£90) is really worth it without access to the black leather sofas. The Friends Room now has a new name and its own website page - the Sir Hugh Casson Room and the Belle Shenkman lounge on the new Friends website. I think the RA have completely forgotten that rather a lot of the Friends are middle aged and older and very appreciative of a comfy place to sit down and have a cup of tea - and a quiet snooze before tackling the train home. It's a triumph of form over function! Lots of hard seats keep the Friends moving through fast. I suspect that those of us who with more than a few aches and pains who always appreciated the comfy seats may well continue to head across the road to the comfort of F&M as the sofas are very definitely no more. However the RA have recently introduced a restaurant and bar in the basement of the Former Keepers House. The latter was where I sat and sketched on the more comfortable banquettes on Thursday night as I waited for the start of the Bloggers' Evening Preview of "Sensing Spaces: Architecture Reimagined" (for images and more about this see my blog post on Making A Mark later today). The bar is comfortable and serves tea as well as cocktails! I then had dinner with Ilaria Rosselli del Turco (Ilaria Rosselli Del Turco - News) - who'd I'd invited to come with me to the Bloggers Preview - in the very nice Restaurant, in the basement of the Keepers House. (see the menu) There I was introduced to Fregola with girolles in a broth with a soft poached egg. It's like a large couscous. Yum! I'll definitely be returning to the restaurant - maybe for lunch next time.